​Tricycles can offer a wide variety of benefits over a traditional bicycle, but carrying around a standard adult folding tricycle can be extremely difficult as they are typically heavy and large. Adult folding tricycles solve this problem by allowing the bike to collapse down when not in use so that they take up only a fraction of the space when in storage or when you need to put the trike in a car or on a bus or train. In this article, we’ll cover everything you need to know about how to choose the best adult folding trike and highlight five of the best options on the market. ​Why does a tricycle need to fold? ​There is a vast array of choices when it comes to adult tricycles​, but only a handful of adult tricycles offer you the option to fold the tricycle. So why might you need a folding tricycle? The biggest reason that many riders want their tricycle to fold up is portability. In contrast to a standard bicycle, which can fit in the trunk of most medium-sized cars as long as the front wheel is removed, adult tricycles can be extremely large and hard to transport in their riding configuration. 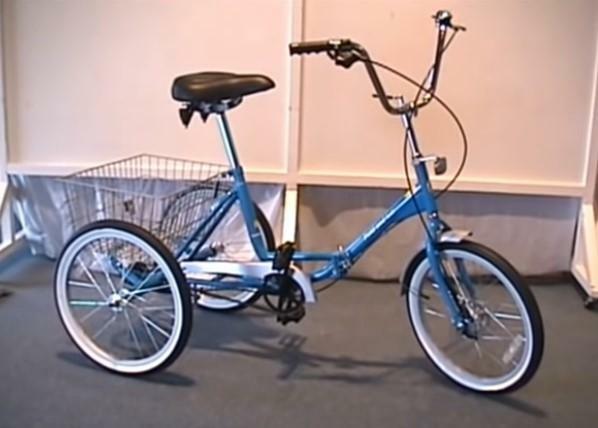 A foldable frame – typically with one latch that allows the front fork and handlebars to be folded down – makes the tricycle just compact enough to fit inside the trunk of a standard vehicle with the front wheel removed. Having the option to load your tricycle into your car opens up a whole new world of opportunities for cycling since it means you can ride in places beyond simply where you can reach from your house. Also, being able to fold your tricycle means that you can take it on a bus or train, which may be important if you live in an urban area where you would like to combine riding and public transport. ​A suspension system isn’t strictly necessary for an adult tricycle, but if you spend much of your riding time on bumpy roads or even on gravel, it can make a huge difference. A suspension system allows the front fork to move up and down, dramatically dissipating the shock from bumps and potholes that would otherwise be transferred directly to your hands and seat. Some tricycles even add springs underneath the seat or at the rear of the bike to further reduce the amount of vibration that is transferred from the wheels to the rider. Note, however, that having a suspension system can also decrease your pedaling efficiency by reducing power transfer from the drivetrain to the wheels. ​How many gears your folding tricycle has can make a big difference in the type of terrain you can tackle and the ease of your ride. Single-speed tricycles are best for riding on flat roads, but even riding at the same gear consistently can get difficult once you try riding into the wind or loading your cargo box down with groceries and other items. Three-speed tricycles offer a good compromise between maintenance and the ability to shift down when riding with a loaded bike or on rough roads. If you ride in an area with a lot of small, rolling hills, you’ll likely need more gears. There are a variety of tricycles that offer six gears or more, although choices for models that offer a high range of gearing may be limited among folding tricycles like recumbent trike. ​The size of the wheels is a large determinant of how close you’ll be riding to the ground and the size of your tricycle when folded since the rear wheels typically stay on. Most folding tricycles opt for 20” wheels to make them more compact and give the frame a lower center of gravity to make it more stable during turns. However, 20” wheels are relatively small and can be less efficient to ride over long distances than the larger 24” wheels that are available on some folding tricycles. ​Tricycles have three wheels and a lot of frames so that they can get quite heavy. If one of the main reasons you’re interested in having a folding trike is portability, then weight should be a big concern. Tricycles range in weight from less than 50 pounds to more than 250 pounds, so be sure to consider what you could comfortably lift into a car when choosing a tricycle. ​Consider Electric tricycle ​if you want motor assistant to feel ​less weight. ​This sturdy adult trike from Kent is designed to handle any rider and poor quality roads thanks to its burly steel frame and suspension fork. The suspension fork works extremely well for diluting the impacts of potholes and other bumps but does draw power away from your ride – not a problem for most trike riders, but something to keep in mind. The frame has a step-through design that makes it easy to get on and off the tricycle. The tricycle features a large comfortable seat with a relaxed body positioning to make riding for long distances as comfortable as possible. Note that the raised handlebars can be quite high, which may put some strain on your shoulders. However, the handlebar design offers multiple hand positions and easy access to the brake levers that activate the included caliper brakes. The bike is single-speed and comes with front, and rear fenders and rear carry cage. Although this bike folds up, beware that it remains quite large. The rear of the bike does not fold, but rather only one section in the front stem. Therefore, even with the front wheel removed and the frame folded, it is very difficult to get this adult trike into any car smaller than an SUV. ​Sturdy steel frame with step-through design and suspension fork to reduce impacts. ​Large comfort seat and multiple hand positions on handlebars. ​Minimal folding such that the trike is difficult to load into small cars. ​This three-wheel folding bike from Mantis sports a retro aesthetic and a comfortable design, as well as large-diameter 24” wheels that can make riding long distances far more comfortable than the 20” wheels found on most other folding tricycles. ​The frame is relatively thin compared to other tricycles, making it more lightweight, although it is still burly enough to hold any rider and a fair amount of stuff in the included cargo box. The folding function is easy to latch and unlatch, and with the front wheel removed the tricycle can fit in most SUVs – however, note that without removing all of the wheels this tricycle will take up significantly more space than comparable 20” wheel tricycles. The tricycle comes with stylish aluminum rims and hybrid tires that are perfect for city and suburban riding at a moderate pace. However, note that these rims and the included tires are relatively narrow, which combined with the overall light weight of the tricycle makes this trike more likely to tip over when making quick turns or carrying an unbalanced load in the cargo box. This tricycle is also a great choice for riders needing to tackle hills because it comes with a six-speed Shimano cassette. The comfort handlebars provide easy access to the thumb shifter, and the entire drivetrain is covered to help keep it clean. ​24” wheels provide more comfortable riding than standard 20” wheels. ​Overall lightweight frame design increases speed and portability. ​Six-speed Shimano drivetrain is good for riding up and down hills. ​Rims are relatively narrow, making this bike prone to tipping. ​24” wheels can make it more difficult to fit this bike in small spaces even when folded. ​This three-speed adult folding tricycle from True Bicycles is designed to be as easy as possible for short people and elderly adults who can’t mount a standard bicycle – or even some tricycles – to ride. The frame is low to the ground so that the tricycle won’t tip over when riding or when stepping onto the seat, and features a step-through design so that getting on and off the tricycle is simple. In contrast to other tricycles, the frame is also available in small sizes to accommodate riders shorter than five feet tall. The tricycle is also one of the best options available when it comes to foldability. Thanks to the small frame size, this tricycle can fit into most cars when folded in the center and has the front wheel removed. The 20” rear wheels can allow being easily removed to fit this tricycle into even tighter spaces. Plus, the tricycle weighs just over 50 pounds, making it extremely portable. Shifting on this tricycle is easy thanks to the thumb shifter on the handlebars. However, note that while the three gears can provide variety when riding on relatively flat ground, they don’t provide enough gearing to tackle hills with this tricycle. The three-speed design is good for moderate to long rides on flat terrain. ​Small frame size and very lightweight design allows this tricycle to be extremely portable. ​Frame size available to fit riders less than five feet tall. ​Available frame sizes may be too small for tall riders. ​This folding trike for adults from Nuvo is designed to charge down any road surface or even gravel paths thanks to the included burly wheels and front fork suspension system. The tricycle features extremely wide wheels with heavy-duty tires, which, although not studded, can easily handle any compacted dirt or gravel in addition to gliding freely over small potholes on the pavement. To add to that, the front suspension dramatically reduces the impact from riding over bumps in the road or on trails, and there is a rear spring behind the seat to further reduce shock from the rear wheels. The tricycle is foldable in the center and is small enough to fit in a variety of vehicles, but beware that the heavy-duty design of the wheels and frames adds up to a significant amount of weight – well over 250 pounds. Therefore, even though this tricycle is designed to fold, it can be extremely difficult to transport. The tricycle comes with a single-speed drivetrain, so it is somewhat limited to flat roads. Also, it has a comfortable seat and a cargo box in the rear. Note that the wheels do not come with fenders and because of their width appropriate fenders will be difficult to find. ​Large and wide wheels designed for on-road or off-road riding. ​Front suspension system and rear spring drastically reduce the shock of impacts to the rider. ​Sturdy design is extremely heavy at over 250 pounds. ​This inexpensive adult folding tricycle from Mantis is perfect for riders on a budget or who want to try out tricycles before fully committing to switching away from a standard bicycle. The tricycle features standard 20” wheels in contrast to the 24” folding version that Mantis also offers, but is otherwise highly similar and has the same solid steel frame. In contrast to the taller 24” version of this tricycle, the 20” version has a lower center of gravity and does not suffer from the same tendency to tip over during sharp turns. The smaller wheelbase also makes this tricycle much more compact when folded, meaning it can fit in the trunks of most vehicles. One of the advantages to this tricycle is the suspension system built into the front fork, which can reduce shock to your hands and bottom when riding on rough pavement. Also, the extremely wide comfort seat has two springs mounted underneath it to dissipate some of the vibrations that would otherwise reach the rider. The single-speed drivetrain is covered to keep it clean and running smoothly, and the front wheel is covered by a fender to allow you to ride in the rain. ​Inexpensive tricycle is perfect for riders just trying out adult trikes for the first time. ​Low center of gravity prevents tipping, and small wheelbase makes it more compact. ​Suspension system and springs under seat reduce vibrations on bumpy roads. ​The steel frame is heavy and does not have a step-through to make getting on and off easier. ​Folding tricycles offer significantly increased portability over standard tricycles, which can be essential for people who live in urban and suburban areas where loading your trike into a car, bus, or train is needed to ride beyond your neighborhood. We feel the True Bicycles Fold-and-Go Three-Speed Folding Tricycle is the best choice for a folding tricycle in large part because of its extremely lightweight. This tricycle weighs just over 50 pounds and folds down smaller than comparable tricycles so that it is much easier to transport than other folding tricycles. Also, the three-speed hub provides just the right amount of gearing for adapting your ride to deal with headwinds or a loaded cargo box on relatively flat roads. Another advantage for short and elderly riders is that this tricycle is available in a wide variety of sizes, including frame sizes designed to fit riders less than five feet tall.